A piquant situation developed near the famous Jhandewalan Mandir here this afternoon when a traffic police constable attempted to stop a runaway motorcyclist who had jumped a red light by pelting him with bricks and stones. He always dreamt of becoming a crorepati. For this, he also tried his luck in crorepati programmes presented on television but never succeeded. Then he decided to blackmail celebrities but his luck could not work even this time and finally he landed in the police net. BSES officials routinely encounter risks, including physical injuries, while conducting anti-power theft raids. Recently, a strong contingent of 17 BSES enforcement officials, accompanied by 21 personnel of the recently inducted CISF force and four Delhi Police personnel, while conducting a joint power theft raid in Vishnu Garden area of West Delhi, was attacked by a 350-plus strong mob. Delhi Chief Minister Sheila Dikshit today called on people to actively participate in conservation of environment by intensifying greening efforts. She further exhorted residents of the National Capital Territory of Delhi to rededicate themselves for conservation of environment and earth keeping in view of challenges arising as a result of global warming and climate change. The Delhi Police today claimed to have arrested the alleged killer of a Tata official at a judge's residence in Patna nearly a month back from Majnu Ka Tila area in North Delhi. Anil Singh, alias Anil Bihari (28), wanted in several cases in Delhi also, was finally arrested by the Crime Branch sleuths from Majnu Ka Tila area, the police said. Women inmates of Tihar Jail here can now look forward to a vocation as a beautician after serving their term, with the prison authorities launching a Beauty Culture course for them. Rapid developments in science and technology have thrown new challenges and opportunities for the legal profession. Therefore, biosafety regulations have also become of utmost importance for the lawyers. The DISCOMS and the Municipal Corporation of Delhi (MCD) today reached an agreement that private power companies would maintain streetlights and all the lights would function. The corporation would pay the bill for the electricity consumed on roads. Jamia Millia Islamia University offers a wide variety of language courses. Today, language proficiency is required not merely for academic pursuits but is also actively linked with trade and commerce. Jamia has made available a slew of language courses for students of all age groups and backgrounds. 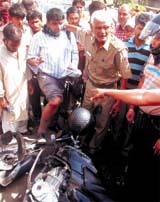 The aim of the constable was accurate and the motorcyclist fell down, sustaining minor injuries in the process. But that was not the end of the story. A crowd of curious onlookers soon gathered at the intersection. Goaded by the injured motorcyclist, they blocked traffic and raised anti-police slogans. Finding himself outnumbered, the policeman discreetly slipped away. The situation was saved from turning ugly with the arrival of the local police. The crowd was persuaded to disperse and the traffic restored. However, it was not clear whether the police were finally able to challan the errant motorcyclist. Senior police officers when contacted said that an inquiry was being conducted into the incident. They reiterated that the public should follow the instructions of the policemen on duty. The crowd itself was divided. While a section had its sympathies with the motorcyclist, another supported the traffic policeman claiming that the traffic in front of the temple had become chaotic and the motorcyclists were a law unto themselves. The incident also triggered off a heated debate whether the traffic policeman was right in using such unconventional methods to stop an errant motorcyclist. 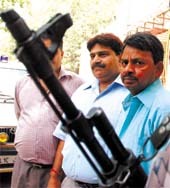 The impostor, Barun Kumar Shukla, arrested from the residence of Amar Singh's residence last morning, allegedly confessed after coming from Bihar here in 1999 he did many odd jobs like coaching in a private academy besides working as an assistant with a senior income tax lawyer. One day, he read about a case pending in the Supreme Court which involved Amar Singh. Then he decided to cheat him. Impersonating as a senior law officer of the Ministry of Law, he allegedly met Amar Singh and demanded Rs 5 crore to sort out all such cases. He was apprehended when he came to collect Rs 1 crore from his residence, said a police officer. The joint anti power theft team, on receiving specific information, raided RZ 11/19 (first and second floor), Peepalwali Gali, Vishnu Garden, and found three brothers, Rajpal, Balbir and Raghuvir Yadav, stealing more than 104 KW of power by directly hooking from a nearby LV Mains to run machines for cutting, grinding and buffing. Rajpal Yadav, along with his associates and family members, present on the site, tried to prevent BSES enforcement teams from carrying out their duty and misbehaved with them. The unruly crowd was dispersed by the accompanying CISF personnel. Shortly afterwards, the unruly mob regrouped, with increased "forces" totalling more than 350 and greatly outnumbering the BSES, CISF and police teams, attacked the raiding party with lathis and bricks. In the ensuing mêlée, a BSES executive received grave head injuries. The mob also obstructed CISF and Delhi Police persons from carrying out legally mandated duties. Subsequently, an FIR was filed at the Tilak Nagar police station against accused Rajpal Yadav and his associates for assaulting, causing hurt and preventing a public servant from discharging his duties. A power theft case, with a penalty of Rs 31 lakh, has also been filed against the accused in the special court at Vikaspuri. Dikshit was speaking on the occasion of World Environment Day. The Environment and Forest Department of the Delhi Government today organised a slew of functions where the Chief Minister gave a brief description of her government's success story relating to enhancement of green cover in Delhi. She also mentioned her recent visit to New York where she took part in a conference on "Climate Change" attended by representatives of 40 cities of the world. She disclosed efforts of the Delhi Government in making Delhi the greenest city were appreciated by one and all in the conference. Environment Minister Raj Kumar Chauhan presided over the functions. Dikshit planted saplings at Garhi Mandu along with students from seven prominent schools of Delhi. In all, 3,000 saplings were planted today. The Delhi Government has been developing Garhi Mandu as a green forest area where around 40,000 saplings have been planted in past two years. The survival rate is 85 per cent. It has been observed that survival of saplings is affected due to presence of Neel Gais. The department has now decided to plant those species of plants which are not liked by Neel Gais for their feed. The department has also decided to plant one lakh saplings in this area during the year. The Chief Minister also inspected Clean Yamuna Drive at Sur Ghat near Wazirabad bridge. Talking to the media, she said the Prime Minister had constituted an authority for cleaning and beautification of the Yamuna. Apart from this, the Delhi Jal Board would also soon implement its scheme of interceptors on all 19 drains falling into the river. She further said her government was also considering the channelisation of the Yamuna by commissioning three big ponds which would help in re-charging the flow of water. All these efforts would bring back the lost glory of the river. The main purpose of Yamuna Cleaning Drive is to make the citizens of Delhi aware about protecting the river from pollution. Dikshit also inaugurated a seminar on "Environmental Issues on Delhi" organised by the Department of Environment and Forest at the Delhi Secretariat wherein she released "Greening Delhi Action Plan 2007-08" and a booklet on "Glimpses of Nature" at 3 Motilal Nehru Place. A nature trail has been commissioned at 3 Motilal Nehru Place which is being visited regularly by the school children. This year, the target of greening Delhi is 18.90 lakh saplings, including free ones. The target will be achieved with the help of different departments and agencies. The Society of Indian Automobiles Manufactures handed over a mobile vehicular pollution-checking vehicle to the Delhi Government. Madhur Bajaj presented the keys of the vehicle to Dikshit. The vehicle will be used to check emission from vehicles. The Chief Minister also presented awards to prize winners of essay competitions on environmental issues of Delhi. At least 2,000 persons took part in the competition whereas 15 were awarded prizes. The first prize amounting to Rs 20,000, second amounting to Rs 15,000, third prize amounting to Rs 10,000 and five consolation prizes amounting to Rs 5,000 were presented in two categories of the competition, i.e. Hindi and English. The seminar on environmental issues of Delhi covered air, water, noise pollution, management of solid waste, electronic waste, hazardous waste, biomedical waste, enhancement of green cover, energy efficiency and its impact on climate change. These issues were discussed by the experts from different organisations. At the end of the day, a cultural programme was organised by students of eco-club schools. The forest and tree cover in Delhi was 30 sq km in 1998 which had increased to 300 sq km in 2007 because of concerted efforts of the Delhi Government. Towards achieving the aim of bringing 33 per cent of geographical area under forest cover as envisaged in the National Forest Policy 1988, the Government of Delhi had decided to develop nine new city forests in addition to existing 14 city covers. The new city forests would be developed at Issapur (66.25 hectare), Rewla Khanpur (22.85 hectare), Kharkari Jatmal (50 hectare), Sultan Pur Dabas (24.76 hectare), Auchandi (0.5 hectare), Mungesh Pur (13.5 hectare), Qutab Garh )27.77 hectare), Hindon Cut Ghazipur (5.00 hectare) and Harewali (24.80 hectare). The Delhi Police today claimed to have arrested the alleged killer of a Tata official at a judge's residence in Patna nearly a month back from Majnu Ka Tila area in North Delhi. Anil Singh, alias Anil Bihari (28), wanted in several cases in Delhi also, was finally arrested by the Crime Branch sleuths from Majnu Ka Tila area, the police said. The accused had arrived here from Jammu when he was arrested following a tip-off, the police added. The Bihar Police had announced a cash reward of Rs 25,000 on information leading to his arrest. He was a habitual criminal but he gained immense notoriety after his name cropped up in the sensational daylight murder of the Tata official Ashok Mahto at the residence of a judge of the Central Administrative Tribunal (CAT) in Patna. 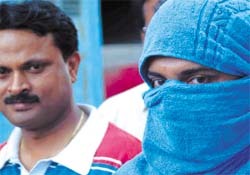 Anil Singh and his accomplice Vikas allegedly forcibly entered the house of the judge and after murdering the senior executive threw down his body from the eight floor of her house. The Bihar Police managed to arrest Vikas in connection with the case but Anil Singh was evading his arrest. After the Patna incident, he decided to shift his base in Delhi. Following a tip-off, he was apprehended near Majnu Ka Tila from a bus coming from Jammu to Delhi. He had gone to Jammu to Vaishno Devi darshan. During interrogation, he allegedly confessed he wanted only to rob the house of the judge but the executive present there tried to intervene, resulting in his murder, said a police officer. The course was launched a month back with the first batch of 20 women prisoners getting enrolled for the training. "The women prisoners will be given training in all aspects of the work. They will also be imparted managerial skills to enable them to efficiently run a beauty parlour," said Sunil Kumar Gupta, spokesman of Tihar Jail. He said a beauty parlour has also been set up in the jail premises to give the trainees practical experience in the work. The jail staff, who have some experience and expertise in this field along with some experts from outside are involved in training the prisoners. The jail runs a number of other vocational training programmes, including computer education and toy making, for the prisoners to help them in rehabilitation. In this context, Amity School of Natural Resources and Sustainable Development in collaboration with the ministry of environment and forests, Government of India, organised a two-day training workshop on 'Biosafety with Special Reference to Cartagena Protocol for Practicing Lawyers of the Country' at Amity University Campus in Noida .This workshop was an endeavour to create a platform for exchange of dialogue between scientists, the legal fraternity, NGOs and other stakeholders, according to a spokesman of the institute. A. S. Chandhok, president, Bar Association of India, High Court, D.D. Verma, country head, International Union for Conservation of Nature, Dr. K.K. Tripathy, advisor, Department of Biotechnology, Government of India, Dr Ashok K. Chauhan, founder president, Amity University inaugurated the workshop. In his inaugural address, A.S. Chandhok said that there was an urgent need to incorporate and spread the precautions adopted under Cartagena Protocol. "Workshop organised by Amity has succeeded in spreading the message," he said. "It will, for example, let countries ban imports of a genetically modified organism if they felt there was not enough scientific evidence, the product was safe and required exporters to label shipments containing genetically altered commodities such as corn or cotton. D. D. Verma said, "Biosafety is a relatively new concern for countries across the world. Safe handling of biological material like plants, animals, bacteria, viruses and even genetic material has assumed paramount importance owing to the sudden advancements in the area of biotechnology. Many foreign corporates like Monsanto, Syngenta have introduced GM crops in India like maize, cotton, wheat, mustard etc. The possible effects of these plants on human, animal and general health of the biological system are unknown. The commercialisation of such crops should not be permitted without stringent safety and enough counter measures being carried out." Ashok K. Chauhan, founder president, Amity University said, "It is very nice to see that a large gathering having great luminaries attending a special workshop on bio-safety. It is indeed every citizen's duty to protect the biosphere." The objective of the Protocol is to contribute to ensuring an adequate level of protection in the field of the safe transfer, handling and use of 'living modified organisms resulting from modern biotechnology' that may have adverse effects on the conservation and sustainable use of biological diversity, taking also into account risks to human health, and specifically focusing on trans-boundary movements. This was decided at a meeting among the Delhi Transco Limited, MCD and the DISCOMS. These were longstanding issues of the MCD. A few issues are still left that would be resolved with the help of the Delhi Electricity Regulatory Commission (DERC), Chairman, Standing Committee of the MCD, Vijender Gupta said. Addressing a conference, Gupta said that an inspection committee would be constituted to inspect the number of streetlights functioning on roads owned by the corporation. The committee would consist of an MCD official, DISCOM and a representative of the Delhi Transco Limited. Wardwise inspection would be done. A total of 272 municipal wards are there, he said. The inspection will be done once a month. Electricity bills of the streetlights will be made on monthly basis. The area councillor will ensure that streetlights function. The DISCOMs agreed to maintain the streetlights with a condition that that the MCD would provide infrastructure. The rate of maintenance of the streetlights would be Rs 73 per pole and electricity charges would be Rs 4.60 per unit. It was also decided that a team of MCD staff would always sit in at the office of Delhi Transco limited. An issue of tax is yet to be settled. The MCD is demanding tax of five per cent of total collection of electricity bills. Jamia has always been a haven for diplomas, degree and post-graduate degrees in Arabic and Persian, apart from Hindi and Urdu. It has recently geared up to new challenges posed by a changing global economy and India's position as a key provider for a variety of services. Consequently, several new language courses have been introduced. Currently, the Centre for Spanish and Latin American Studies (CSLAS) at Jamia offers advanced diploma, diploma, and certificate in Spanish, Portuguese, French, Russian, and Italian. The last date for submission of application forms for all courses offered by CSLAS is June 30. The other sought-after language courses as already mentioned are an advance diploma in Modern Arabic Language and Translation, diploma and certificate courses in Modern Arabic and Modern Persian, PG diploma in Iranology, diploma and certificate in Pashto, Turkish, Kazakhi, Turkmenian (last date June 31). Increasingly, language courses are in great demand by those pursuing research or academic activities as well as those who seek careers as professional interpreters and for retail, call centers, and BPOs. Diploma and certificate in translation proficiency offered by the Department of English are also useful given the burgeoning need for translations.